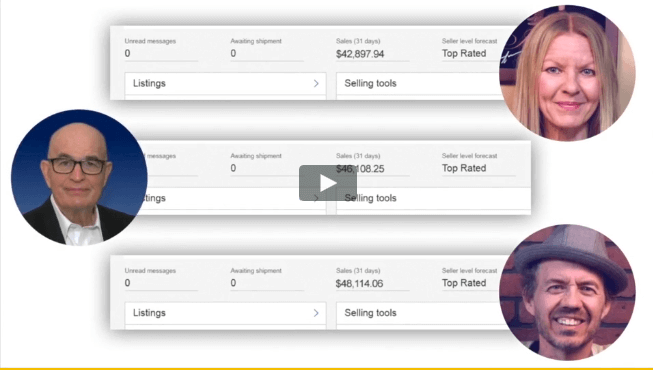 I’ve come across a new program that claims it can help people make $3,624.18 on eBay, and it even promises you that you can start today with zero investment required. You might have visited their site and find this program to be a great opportunity that you need to take advantage of this year. But before joining this program, you want to know if it’s the real deal or just another scam that you need to stay away from. This EB Formula Review will give you all the essential info so you can make an informed decision about this program. In fact, there are some important things you really need to know first before joining! 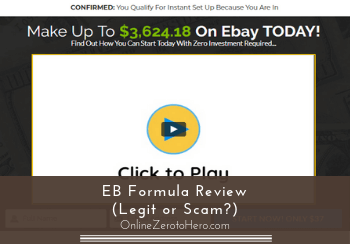 EB Formula is a program that claims it can help you make $3,624.18 on eBay, and it even promises you can start today with zero investment required. This program supposedly uses dropshipping and eBay to bring in enormous amounts of money to your bank account and anyone is qualified since the requirements are not too steep. Honestly, dropshipping is a lucrative business model, and it’s being used by a lot of online business owners to make money online, but the issue I have with this program is that they make it sound too easy to earn an income through dropshipping. As for me, I cannot recommend this program since it has some big red flags that, in my opinion, make it a risky investment. These red flags are huge deal breakers, in my opinion, and I would, therefore, suggest that you find other legit opportunities online that can genuinely give the results you deserve. What is the EB Formula and what does it offer? According to Dan Wright, the so-called owner, and creator of this program, EB Formula is the hottest system today that will lead you to financial freedom. It uses dropshipping and eBay to bring in enormous amounts of money to your bank account and anyone is qualified since the requirements are not too steep. According to Dan, you only need to do these 3 steps. The 3-step process will supposedly only take you 20 minutes to set up, so anyone can do it even if you don’t have any technical skills. If you’re new to dropshipping, it’s a legit business model where you sell products using various market platforms like eBay or Amazon, but you’re not keeping a physical stock of your products. Usually, you buy the products from Alibaba or similar platforms and list them on eBay at a higher price, but the one who fulfills the order is your trade partner abroad, and most of the time they are wholesalers, and they have a warehouse in another country like China. The typical way of doing dropshipping is to create your own ecommerce store, but it’s different from EB Formula because you will be selling your products directly on eBay. Honestly, dropshipping is a lucrative business model, and it’s being used by online business owners to make money online, but the issue I have with this program is that they make it sound so easy to earn an income through dropshipping. In my opinion, successful business owners have created their full-time income online through proper training, hard work, and patience. 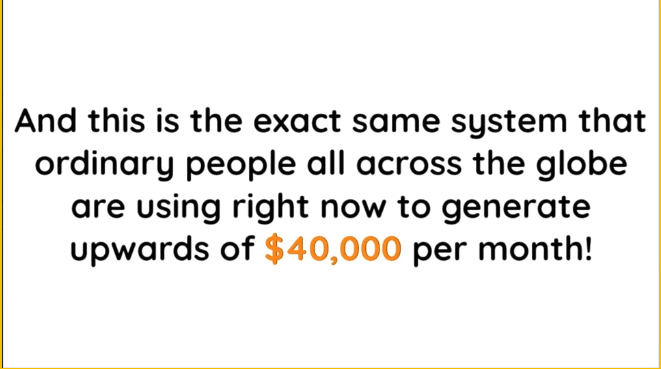 There’s NO secret system that can easily generate the money for you without making any effort on your end. When I first visited the sales page of EB Formula and saw the outrageous income claims on their video, I became a bit skeptical because they are just showing all the positive outcomes without giving many details on how their system works. If you’re like me, you would be doing a bit of research to know exactly if this program can provide you with the results you are looking for. That’s why I wrote this review so I can share with you all the red flags that I have uncovered from their sales page. These are important to know so you are aware of what you need to consider before joining and what you are getting in to before joining. And in my opinion, there is A LOT you are not told on the sales page and the video. Here are some of the red flags you should know about EB Formula and take into consideration before joining. According to Dan, anyone can easily make money if they use his revolutionary system, so he claims that selling on eBay can be done by anybody without technical skills or prior experience to that platform. In reality, this is NOT exactly true because you need to do a lot of research to find the best products to sell on eBay, and you also need to take into consideration that you will need to handle potential refunds, which takes time. As a matter of fact, to earn at least $500 a day, you will need to sell a lot, and I mean a high volume of products before you get some profits because it’s hard to sell high-value items on eBay. Therefore, if you’re still starting out on that platform, you’ll be selling low-cost items, so the margin of profit is also not that high. Another thing I would like to point out is the fact that you’ll be in charge of customer service since you’re the one who listed the products on eBay, so you’ll be responsible for the refunds and other customer relations activities. In my opinion, handling customer service, product research, and a listing of products on eBay can be hard for beginners to do, because it requires proper training and time to learn. So, when Dan claims on the sales video that ordinary people are becoming very wealthy from doing almost no work whatsoever (they just need to use his secret system) – it is unrealistic and, for me, a careless statement to make. You should consider this red flag when making your decision about this program. On the EB Formula sales video, you will see testimonials from their so-called successful clients, but you really can’t verify their income claims or if they are bonafide members of EB Formula. Also, I did a bit of research on their testimonials, and I found out that these people are freelancers from Fiverr. So, I can safely say that they are using freelance actors and actresses to do their testimonials and these people are NOT real members of their program. They are just being paid to do these testimonials, which is quite common among similar types of programs that I have reviewed in the past. 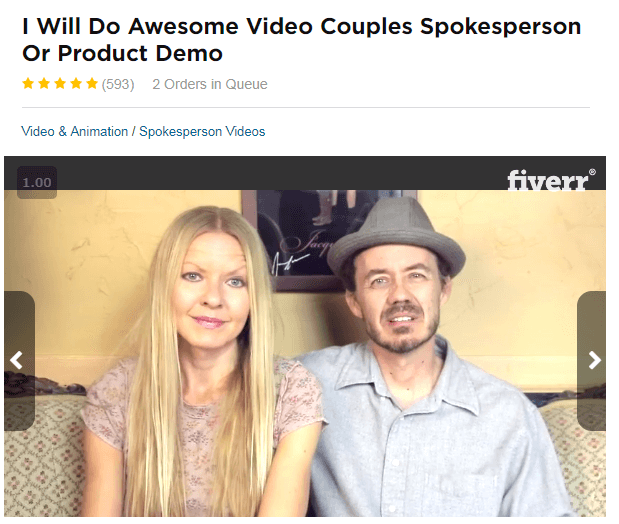 They are using Fiverr actors on their testimonials. I can even recognize some of the actors since they also appeared in a program called Ecom Cash Crusher. Some of the Fiverr actors I have recognized from another program called eCom Cash Crusher. In my opinion, this is a breach of trust between the owners of this program and you as a potential customer, because using fake testimonials is a cheap and, in my opinion, unethical way of promoting a product. I would suggest that you take this red flag seriously, since using fake testimonials is NOT something you should tolerate – especially if you’re very particular with transparency (and you should be if you want to succeed online). Red flag #3 – Beware of the hidden costs!